Posted on August 1, 2012 by Sarah L.
Today was such a fun day. We went dress shopping for Carrie’s wedding – by “we” I mean Carrie, her mother and I, and we found the dress! We had so much fun matching veils and jewelry with dresses and driving around town to find the perfect dress at the best price, of course. We had a great lunch… I’m seriously looking forward to those left overs … followed by cupcakes. 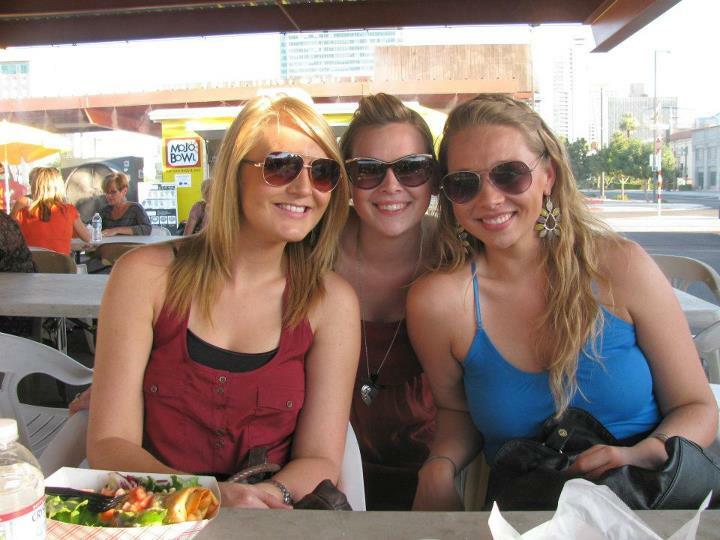 Then we met up with my new friends Lauren and Bobby for a roach coach food fest in downtown Phoenix and binged on French fries, fried pickles, Indian fry bread (noticing the theme here?) and ice cream. I’m going to have to go on the diet of the century when vacation is over, but for now, man, I am enjoying everything soaked in oil. ly not sure if that’s a joke or not. We just don’t get along. I think he’s arrogant, he thinks I’m spoiled, or whatever he thinks – I’m actually not sure. But Barry, his best friend for as long as I can remember, also made a long drive to come hang out for a little while. He’s been at law school and completing a fellowship, so I haven’t seen him in years. I hate to admit it, but I wouldn’t have made the less than five mile drive to see my brother if he weren’t there. Franks apartment is suitable for one of those Febreeze commercials, where the people are blind-folded and placed inside of a wrestling ring or garbage truck or whatever. I didn’t want to touch anything, but I didn’t want to look like I was avoiding touching anything either, because I’m already spoiled. The three of us talked for about an hour or so, debating politics and religion and nationalism as it relates to security. Although I don’t care for my brother’s company, it was nice to have somewhat deep conversation with compelling arguments on both sides, without personal attacks and frivolous exceptions on either side. This is probably one of the only times we’ve been in the room together for more than an hour without spawning a riot. I’m glad we’ve both grown up enough to at least be able to be in the same room as each other. I realize that sounds extremely immature and borderline pathetic, but it’s major strides for us.